With our distinctive collections, Sunset West provides superb quality, comfort and value. Founded in the beautiful climate of Vista, CA we know a thing or two about enjoying the outdoors. From the inception of the company in 2004, it has been our passion to bring together, quality, comfort, design and value into the outdoor living space. Sunset West offers under one roof a spectrum of styling and design, from the contemporary La Jolla and Manhattan collections to the over scaled Monterey. 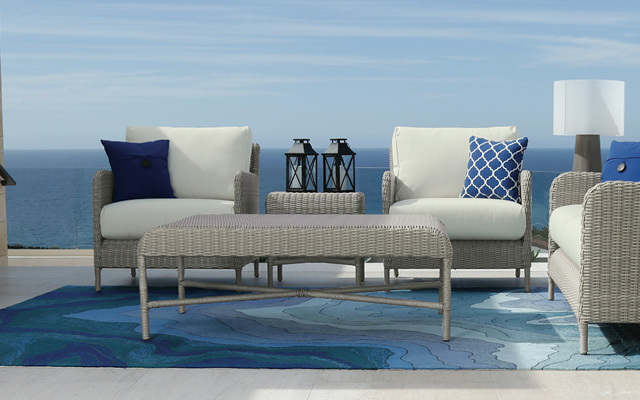 Our collections are produced using a variety of materials from cast and extruded aluminum, to multiple shapes, textures and colors of resin wicker. Known throughout the industry as the best in outdoor performance fabrics, we exclusively specify Sunbrella fabrics in the manufacturing of our cushions. The Monterey is a larger scaled collection that offers an old world bronze finish over both cast and extruded aluminum components. Stop by and see other collections or ask an associate to show you samples of Sunset West’s woven designs and the furniture pieces available in your favorite choice.